As I read through my learning in my old blog posts from my year of creativity, and enjoy some garden-fresh fruits and herbs, I'm finally reaping the rewards of seeds I planted. I've been nurturing my creative dreams and my little garden alongside each other. The fruits of my labor, both in the garden and in my creative life, are tasting ever so sweet! Gardening is teaching me patience and careful observation of nature. I harvest delicious things to eat. The creative process and building of a creative life are teaching me patience and careful observation of my own human nature. I harvest a growing body of work and confidence in my creative abilities. 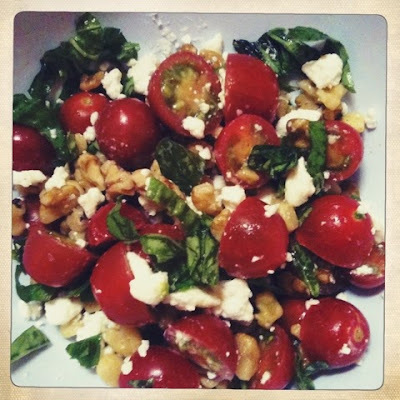 I journaled and made Bruschetta Salad to celebrate this beautiful summer day, ripe with possibility. This refreshing and energizing snack is a healthy spin on traditional bruschetta, low carb, no oil or salt added. Simply toss a handful of your favorite teeny tomatoes with a few leaves of torn basil, 1/4 cup of chopped walnuts and 1/8 cup of fat free feta cheese. Add a spritz of fresh lemon and a dash of pepper to taste. The flavors are amazing together, even minus the mozzarella and bread! The growing season has just begun! What creative seeds are you nurturing or beginning to harvest?